Full HD quality video (1280 x 720) at 30fps. 120° wide angle lens with a 2MP CMOS sensor. Wifi enabled to connect to a mobile app (via optional Wifi dongle). MicroSD cards up to 32GB. 8GB card supplied. Combine all that with our fondness for front and rear dashcam set-ups and we were delighted to receive the Mi-Witness Driver Special bundle to take a look at. As well as the main Mi-Witness HD camera unit, this package also includes a neat little rear camera along with some other goodies including a wifi dongle, a hardwire kit and a smart little protective case. Upon opening the package, we were pleasantly pleased with the main, front-facing camera. Largely black, to help it remain inconspicuous when installed, it finds a good balance between simplicity and functionality. With just one main button on the left-hand edge (looking from a drivers point-of-view), which also acts as a light so you can tell how the camera is working, the camera doesn't invite interaction, and nor should it. The Mi-Witness is designed to be set-up, installed and forgotten about unless absolutely necessary. Elsewhere on the camera, there are two small indicator lights that tell you if the camera has power and whether the GPS signal has locked in. Just above these is a USB port hidden beneath a sturdy rubber cover which is where the wifi dongle is attached. By offering wifi functionality as an optional extra, the Mi-Witness HD becomes a package that can be tailored to an individuals needs. The USB slot will apparently also be used for other functions in the future which may offer even more customisation options. Around the camera are ventilation holes to let heat escape and on the right-hand end, there are two sockets for the power cable and the rear-camera cable to plugged into, along with a slot for the Micro SD card, again covered by a rubber guard, to stop and unwanted dirt getting in. Overall, the camera feels like it's built with quality in mind. Installation was a breeze with just two cables to worry about. The first was the power cable which I could easily run along a well-worn route in my car due to installing cameras quite frequently. However, the cable is easily tucked behind trim and under carpets so an expert-looking installation is easily achieved in any car. The second, longer cable, connects the front and rear cameras so needs to run the full length of the car. Yet again, this was easily hidden, apart from a small connector a metre or so away from the rear camera which needed some creative thinking! However, this connector could also be useful should the rear camera need to be disconnected, without having to remove the whole wiring system. Both cameras stick to their respective windscreens with adhesive pads and held firmly in place. Each allows for up and down adjustments so it's important to align them straight in the first place. This is one of the benefits of the Mi-Witness's smartphone app. By plugging in the wifi dongle, the camera can connect to your iOS or Android device and stream live images via the free apps that are available to download. 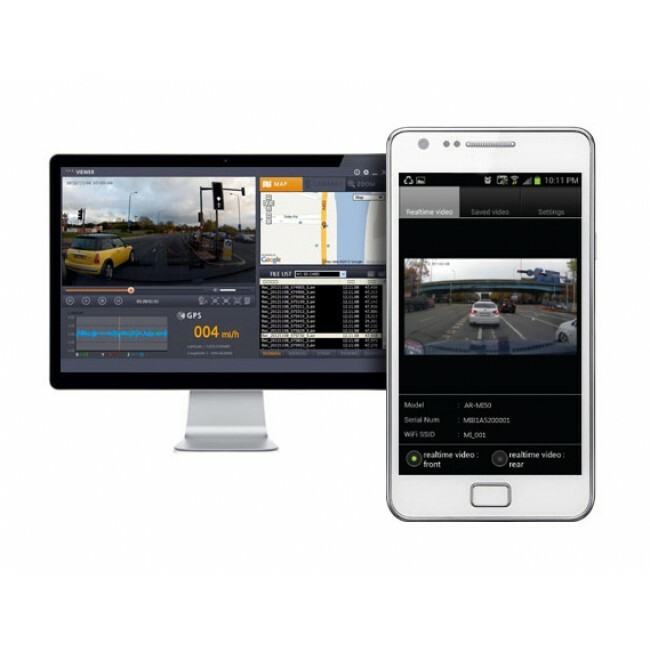 While this particular benefit may only be useful during installation, the apps also allow you to manage the cameras settings and view your recorded footage. This can be very useful if you're involved in an accident and wish to review the footage at the scene. Upon turning the camera on, it burst into life with a cheery voice message and a flash of red light from the main button. At night I found this light to be a bit too bright as it flashes while recording but it can be turned off. From then on the camera would record faultlessly each time, switching between the normal 'continuous' mode and it's 'parking' mode as required. It would also detect 'events' using it's internal g-sensor and store these video files away for safe keeping. One unique feature to the Mi-Witness is that you can allocate space on the memory card for use with each particular type of video file that the camera can record; normal, event, parking and manual, which are videos that you trigger yourself by pressing the button on the camera if you spot an incident in front of you. While this feature might be slightly too advanced for every user, it does mean you can adjust the way that the camera stores data, allowing you to put heavier emphasis on capturing specific types of videos. Leave your car parked for long periods? Then increase the amount of parking files that it can hold before overwriting itself. Don't feel the need to manually record? Then reduce this portion to give space to the other videos. Footage can be viewed on the Mi-Viewer software, which I think is one of the better pieces of dashcam software that I've used. It's well designed and very intuitive, but I do use a lot of these programs so maybe I'm just more used to them! All of the relevant information is laid out in a way that makes it easy to see and a range of icons let you navigate through the various tools available to you. I particularly like the 'zoom' tool which lets you hover your mouse pointer over a particular area of your video and you see a smaller zoomed in picture, helping you to make out finer detail, such as number plates. It's also easy to view the footage from the rear camera, either on it's own, or alongside the front camera video in a slightly smaller window. The Mi-Witness HD records in 720p, which isn't the highest specification available in a dashcam, but it still delivers good image quality. The footage portrays a clear view of the activity around you and, while the finer detail isn't always easy to make out, it would enable you to establish the cause of any incidents you were involved in. In the age of ultra high-definition, it's easy to forget the purpose of dashcams and get obsessed with being able to see every tiny detail, rather than just being able to establish a timeline of events leading up to an accident, which the Mi-Witness enables you to do. So, in summary, it's easy to see why the Mi-Witness HD has received such recognition in recent times. With excellent build quality and a host of accessories available for it, the Mi-Witness HD is an outstanding choice, whatever your specific dashcam requirements are. Mi-Witness are engaged with their customers via their online forum and, along with the community of users that they've built up, offer a level of support that other manufacturers would do well to emulate. 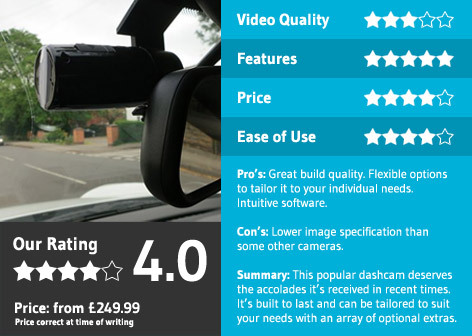 While the camera's image quality has room for improvement in comparison with some other dashcams, it is a highly capable unit.